Wolf Patrol is one hub of a loose network of North American and European groups that use citizen monitoring to bring public attention to the practice of trophy hunting – which they say is little more than state-sanctioned animal cruelty. "I can't imagine seeing wolves being gunned down from helicopters," Knowles told me during one of our conversations. "It is such a tragic and inhumane killing and to bear witness will be the most challenging thing I've ever had to deal with." That, of course, is the point: To make sure that we all have to bear witness to the harsh reality of trophy hunting, until we can't stand to look anymore, and finally decide, as a culture, to do something about it. Stephanie looked in her rear-view mirror and watched as the black Suburban descended upon her Jeep. She punched the accelerator in an effort to put some distance between the two vehicles, but the Suburban kept gaining. Matthew, riding shotgun, turned in his seat to watch it. "She's trying to come up beside us," Stephanie said. The Suburban swerved hard left, then right, nearly hitting another vehicle. A forty-something woman was driving. Her face was an angry blur, her mouth open and shouting. She lifted an iPad, evidently in an attempt to capture some photos or video of Matthew and Stephanie. "She forgot to turn it around," Matthew said as the hulking Suburban sped up to them. "She's taking pictures of herself." Stephanie kept her eyes on the road as she hit the gas again. When they reached a four-way stop on the two-lane road they had been driving along, she turned right to return to their home base in the village of Barron, a Wisconsin farming community north of Eau Claire. The woman in the Suburban made a U-turn and headed in the direction she had come from. Stephanie and Matthew (who didn't want their last names used for security reasons) could pass for brother and sister. Both are 25, slight, dark haired (Stephanie's has a wide streak of blue through it), and look younger than they actually are. And they both share a passion for protecting wild animals – especially wolves. It was December 2014, about a month after the two had joined forces with an outfit called "Wolf Patrol," founded by Rod Coronado, the legendary eco-warrior – or, as some might say, infamous eco-saboteur. Wolf Patrol observes and documents wolf hunts in the United States with the goal of exposing the cruelty of wolf hunting. The idea is to help change public policies and, when necessary, reveal illegal activities on the part of hunters. Stephanie and Matthew had been on a hunting observation mission that winter day, which is what got them involved in the high-speed chase. Earlier that day, Stephanie and Matthew had come across a group of hunters parked alongside a rural road. CB antennas stuck out from the cabs of their trucks, a telltale sign of a hound hunter. One of the pickups had built-in kennels, and it rocked back and forth with the movement of the hounds inside. Three men stood hunched over something that lay within the folds of a blue tarp. They lifted the tarp, the center of it sagged, and Stephanie noticed a patch of what looked like grey fur. The pair slowly drove past the truck, trying not to stare. "I bet it's a wolf," Stephanie said. Wisconsin is the only state that allows hunters to use hounds to pursue wolves, but the 2014-2015 hound hunting season hadn't opened yet. If the hunters had killed a wolf with the help of hounds, they would be poaching, and finding poachers is a top priority for Wolf Patrol. Stephanie and Matthew turned their Jeep around and drove by the hunting party again. By then, the men had dropped whatever was in the tarp into the back of one of the trucks and were leaving the scene. The Wolf Patrol members followed the pickups until it seemed that the hunters had become aware of their presence. The pair had been trained by Coronado to de-escalate potentially threatening situations, and they decided to break off their pursuit. But within moments the swerving Suburban was on their tail. When Matthew and Stephanie later debriefed the scene with Coronado and other Wolf Patrol members, they figured that one of the hunters must have called the woman, who, irate at the intrusion of ogling strangers on her home turf, went after the Jeep. It's possible she knew Matthew and Stephanie were with Wolf Patrol. News of the group's presence had spread quickly in rural Wisconsin, and the locals appeared to be doing their own surveillance of Wolf Patrol's anti-hunting vigilance – the watchers themselves were being watched. Pro wolf-hunting Facebook pages were filled with threats against Wolf Patrol and its members. Most of the posts were seething with anger. One recent post read: "Kill ALL The Wolves. You pathetic losers will never save one wolf. I have two Yellowstone wolves hanging on my wall with more to come. Ha ha ha ha ha ha haaaaaa." Wolf Patrol is one hub of a loose network of North American and European groups that use citizen monitoring to bring public attention to the practice of trophy hunting – which they say is little more than state-sanctioned animal cruelty. The new wave of animal rights activism is a far howl from the actions of EarthFirst! and the Animal Liberation Front, both of which are known for breaking the law to defend animals and the environment. Unlike the by-any-means-necessary ethos of those organizations, Wolf Patrol is scrupulous about following the law. The group doesn't spring animal traps or block roads, nor does it in any way interfere with the activities of hunters. Rather, Wolf Patrol acts as a kind of backwoods neighborhood watch: It keeps a close eye on hunters to ensure they aren't breaking state and federal hunting regulations, and when it does encounter illegal behavior, reports it to the appropriate authorities. Wolf Patrol's avoidance of EarthFirst!-style monkey-wrenching marks an evolution for the group's founder, Rod Coronado. Longtime environmental activists might recognize his name. In 1986, when he was 20 years old and a member of the Sea Shepherd Conservation Society, Coronado and a comrade spent a freezing November night sabotaging a whaling facility in Iceland. Dressed in dark rain gear and wearing ski masks, Coronado and his companion smashed the computers and destroyed the equipment of the Hvalfjördur whaling station. They then opened the seawater control valves on two of the station's four whaling vessels, sending the ships to the bottom of the harbor. The attack involved no harm to any person, but it did cause more than $2 million in damages. Coronado, who had fled to London after the sabotage, never served any time for the Iceland anti-whaling operation. But eventually his illegal activities caught up to him. In the 1990s and early 2000s Coronado was a key part of "Operation Bite-Back," a nationwide campaign waged by EarthFirst!, the Animal Liberation Front, and the Earth Liberation Front against hunting, animal testing facilities, and other alleged animal rights violators. In 1995 he was convicted of participating in an arson attack against a Michigan State University research facility and sentenced to 57 months in prison. In 2004 he was indicted on three charges of dismantling mountain lion traps, and just a year later he was convicted of a destroying property belonging to the US Forest Service. While serving an eight-month sentence, Coronado experienced a change of heart and came to the conclusion that property destruction and other forms of sabotage were ineffective and counterproductive strategies for social change. In an open letter to other practitioners of direct action that he penned from his jail cell, Coronado wrote, "I still see the rationale for what I've done, only no longer do I personally choose to represent the cause of peace and compassion in that way." His tactical conversion was, in part, the result of becoming a father. "Don't ask me how to burn down a building. Ask me how to grow watermelon or how to explain nature to a child." Following the law isn't always easy for Coronado, however. In a recent interview with Black and Green Review, an "anarcho-primitivist magazine," Coronado describes an episode in which he and his crew observed someone setting a wolf trap. Coronado and his companions rigged up a trail camera in the hope of catching footage of a captured animal, footage that they could then use to expose the brutality of trapping. But that night Coronado couldn't shake the regret that he could have done more. He told Black and Green Review: "As we drove back to camp, I started thinking about the wolves in that area, in particular, that one wolf that might happen upon that trap and be caught and killed. I thought about it, thinking that somewhere there was a wolf right at that moment catching the scent placed on that trap and possibly traveling towards its imminent threat. I started crying because I felt horrible. I consider myself a cousin to the wolf. He is my relative and I care about him. And here I was walking away from a threat placed specifically for him and all I could do was take pictures of his suffering. I cried struggling to rationalize my actions, knowing if I did more, I might go right back to prison." Coronado's newfound lawfulness sometimes alienates potential allies. Not long after he launched Wolf Patrol in the fall of 2014, he was joined by a young man who had previously been a member of Britain's Hunt Saboteurs. When Coronado told the new recruit that if he found a wolf in a trap he would have to leave it there, the guy split, unwilling to abide by the rule. Coronado had worked with Hunt Saboteurs before (he had helped popularize the group's work among North Americans), and in some ways the British organization serves as the global model for those determined to expose hunting practices. The Hunt Saboteur Association was founded in 1963 with the primary purpose of ending fox hunting in Great Britain. The Hunting Act of 2004 put new restrictions on hunting with dogs, but the traditional practice continues at many hunting clubs. Historically, Hunt Saboteur members – known as "sabs" – would monitor and document the hunts. Sometimes, they would interrupt them. Most often this was done by trying to distract the hounds by, among other tactics, blowing a hunting horn to confuse the dogs or sprinkling lemon oil on the fox trail to mask its scent. Sometimes they would play a recording of baying hounds through a loudspeaker, which would send the hounds running in the wrong direction and, following behind them, a confused (and annoyed) group of mounted hunters. The sabs continue this work today as they seek to expose illegal fox hunts. The website of the Hunt Saboteurs Association says: "One of our greatest weapons is now the video camera – enough instances of hunts breaking the law caught on camera and hopefully not even the blinkered politicians will be able to ignore it." Wearing their signature black facemasks and travelling across the countryside in groups, Hunt Saboteurs can be a fearful sight. But their appearance doesn't deter the red-coated hunters from sometimes attacking them. The animosity between the hunters and the sabs is as intense as that between rival gangs, and it's most often the sabs who get hurt (though there have been injuries on both sides in the course of confrontations). In August 2014, for example, a young woman protesting a hunt was run down by a huntsman on horseback. She suffered seven broken ribs, a collapsed lung, and trauma to her shoulder. Despite the dangers involved in being a sab, the Hunt Saboteur movement continues to grow. In recent years, knock-off groups have formed in other European countries, the US, and Canada. The hunting saboteurs are, in a sense, warriors for wildlife. The mixed-used landscape of western Wisconsin would seem an unlikely home for wolves. It's farming country, with barbed wired pastures holding cattle and thick-coated horses. Farm houses are scattered here and there, most looking like they've come to terms with their ultimate return to the earth. The terrain doesn't much resemble the wolf-heaven of Yellowstone's Lamar Valley or the dense forests of northern Minnesota. Yet wolves do, in fact, live in Wisconsin – plenty of them did, before the hunting began. They've adapted to find cover in bogs, parcels of uncut forest, and the strips of timber that sandwich the creeks. Grey wolves were extirpated from the state by the 1960s – the victims of a relentless campaign of trapping, hunting, and poisoning. But slowly wolves returned to the Badger State as lone dispersers and then whole packs traveled southward from the timberlands of Minnesota. They thrived under the protection of the federal Endangered Species Act. By winter of 2011, there were somewhere between 782 and 824 wolves in the state, according to a census by the Wisconsin Department of Natural Resources. But when federal protections for wolves in the Great Lakes Region were lifted in January 2012, a hunting season was quickly established. That year, 117 wolves were killed. In 2013, the number was 257. By the end of the 2014-2015 season, a total of 528 wolves would be lost to trapping and hunting. When I traveled to Wisconsin in December 2014, it was the last week of the wolf-hunting season. 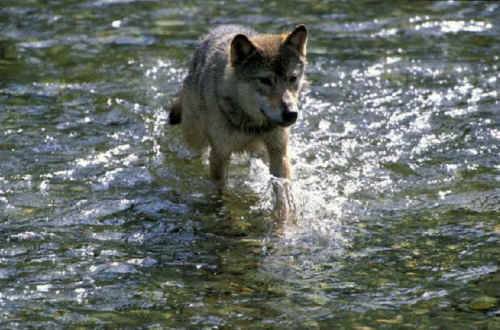 Hunters had already filled the wolf quotas in four of the state's six game units, and they didn't have much time left. Wolf Patrol expected a lot of activity. The days start early for Wolf Patrol as they shadow the hunters. We hit the road at 5 a.m. to begin the patrol of Zone 3, a section of western Wisconsin bordering Minnesota. Four other Wolf Patrol members were scouting nearby in two other vehicles, all communicating via cell phone. If one group came across hunters, they were to call the others to join them, the goal being not to harass or interfere, simply to observe and record the hunters' activities. I'm in a beat-up Toyota 4Runner with Coronado. At 49, he's trim and fit, the coppery glint of his skin hinting at his Pascua Yaqui Indian background. As he drives the back roads he is busy scanning the horizon with his typical unswerving intensity. We spend six hours in the car, but the only hound hunters we see – dressed as expected in camouflage and worn, heavy boots – are the ones enjoying a leisurely breakfast at a local cafe. We watch them through the windows, not wanting to blow our cover. The beds of the hunters' parked trucks hold wooden hound boxes, but we see no dog faces poking out, nor do we hear any whining or baying. There has been no new snowfall, and the old snow is mostly gone. These conditions, I'm told by Coronado, aren't ideal for setting a pack of dogs onto the trail of a wolf. The hounds are likely at home. Coronado drives on, through miles and miles of country, over dirt roads, on private land and then on public land. He stops to review a map, then goes on again. There is likely at least one hound hunter in the area and Coronado is determined to find him. He speaks on the cell phone with his crew. They haven't seen any action either. There is talk about the quota. Some game zones have gone over their allowed number of kills, so Wolf Patrol initiates a phone campaign to the Department of Natural Resources to demand a halt to the hunting season. (More than 200 calls were made to the agency, we later learn.) The sun is melting the remnants of snow and warming the air. Nothing much happens. Back on the road after a short break to stretch our legs, Coronado gets a call. The 2014 Wisconsin wolf-hunting season is officially closed. The quotas in all game zones have been met. Hunters have killed 154 wolves, but at least it's over. As Coronado points out, "It's a hollow victory. The hunting is over but the training continues." Just a few weeks later, on December 23, 2014, a federal judge would return Endangered Species Act protection to the Wisconsin wolves. But Coronado's work continues. Despite its name, Wolf Patrol doesn't monitor only wolf hunting. In Wisconsin, bear hunting is also a popular tradition – and big business for guides and outfitters – and Coronado and his crew spent much of 2015 watchdogging the activities of bear hunters. Often, bears are hunted after being baited with an irresistible lure. Bear bait can consist of cookie dough, donuts, candy, grease, chocolate, or a concoction of all of the above (or a commercially prepared high glucose paste made especially for this purpose) that is stuffed in a hollowed-out stump at a bait site. A Wisconsin Department of Natural Resources survey of bear hunters determined that 4.63 million gallons of bear bait were dumped at 82,300 sites in 2014 alone. Coronado explains that not only do bears become habituated to bait sites, but deer do as well. And where there are deer, there are wolves, creating the opportunity for deadly run-ins with hunters and their hounds. Then there are the run-ins between Wolf Patrol and area hunters and law enforcement. While monitoring bear baiting in eastern Wisconsin in the summer of 2015, Wolf Patrol was accused by the Polk County Sheriff's Department of being in violation of Wisconsin's hunter harassment law, though no charges were filed. Then, in September 2015, Wolf Patrol members were caught in a heated confrontation with some local hunters. Videos shot by Wolf Patrol members show the build-up of tensions between the group and hound hunters. In one video, which was filmed on a rural road in the Chequamegon-Nicolet National Forest, Wolf Patrol's vehicle is purposefully blocked in for half an hour by a hound hunter's truck. When Coronado backs up in an effort to leave, the hound hunter drives in closer, preventing his escape. Another video, shot just two days later, shows at least a dozen hunters angrily confronting Coronado and his group. One hunter asks Coronado if he's a convicted felon. Coronado says, "Yep, done my time." The hunter responds, "Once a felon, always a felon." Coronado displays restraint. He appears calm and confident, and he doesn't back down. Coronado is anything but a rookie, and he knows how to de-escalate a potentially dangerous situation. He engages the hunters without inciting them. Eventually some local sheriff deputies arrive and the situation is defused. A new Right to Hunt bill, introduced in the Wisconsin legislature in October, reflects these growing tensions, and is a direct response to Wolf Patrol's monitoring activities in the state. If passed, AB 433 would strengthen Wisconsin's existing hunter harassment law by adding protections to hunting-related activities like scouting, dog training, and animal baiting. It would also criminalize engaging in "serial conduct" that is intended to "impede or obstruct a person who is engaged in lawful hunting," including photographing or filming hunters, maintaining proximity to hunters, or approaching or confronting hunters. In addition to angering hunters, Wolf Patrol's confrontational tactics are controversial among some wildlife advocates too. Even in the close-knit community of wolf defenders, Wolf Patrol isn't always welcomed. Some people feel the group is undoing years of effort to build relationships with those, especially ranchers, who aren't fans of Canis lupus. A staffer with a well-established wildlife advocacy group, who spoke on the condition of anonymity, told me: "Wolf Patrol is stirring the pot. Their work is antagonistic and polarizing and now we have to deal with it." This person said Wolf Patrol's presence in Montana in the fall of 2014 was one of the reasons an effort to create a "Montana Wolf Stamp" failed. The measure would have allowed non-hunters to buy a $20 "wolf stamp" – sort of like a fishing license – to support wolf conservation programs in the state. But in September 2014, after receiving more than 50,000 comments on the issue, Montana Fish, Wildlife & Parks dropped the idea. According to some wolf proponents, Wolf Patrol's sudden presence in the state and the ensuing controversy caused the state agency to shy away from any activity that would appear unsympathetic to the ranching and hunting community. Others in the wolf advocacy community applaud the efforts of Coronado and his crew. Wally Sykes is a wolf advocate living in northeastern Oregon, home of Oregon's natal packs. He is the co-founder of Northeast Oregon Ecosystems and a member of the Wallowa County Wolf Compensation Committee, as well as a member of the Pacific Wolf Coalition. When I asked Sykes for his opinion of Wolf Patrol, he said, "I support the Wolf Patrol groups in the Upper Midwest. I believe the campaign to ensure significant and healthy wolf populations, free of persecution for sport and profit, needs both soft and hard power. Too much effort and money is spent on trying to reason with and accommodate wolf-haters and not enough to actually oppose those who go out and kill wolves, and what could be more effective than to have people out there looking over the shoulders of the hunters and trappers to expose their methods and acts?" For his part, Coronado seems unfazed by the controversy, just as he seems unaffected by positive publicity. But he admits that he finds the negative reaction divisive. "They need to be less mad at us and more mad at the problem," he says. On September 7, 2015, a video appeared on Facebook of a grizzly bear struggling to escape the shots of trophy hunters. The clip was less than two minutes long, but it felt much longer. The scene begins with a lanky, dark brown bear making his way down a mountain slope when shooting starts. Hit in the hindquarters, the bear twirls in circles, then straightens and runs. The animal is hit again, and then a third time. A hunter is heard saying, "You shot behind him!" The shooting resumes and the bear drops to its side, alive but mortally wounded. Streaks of blood stain the snow below its body. The hunters are heard laughing as the bear rolls down the hill like a log until it stops, presumably dead, against the side of the mountain. In the space of just a few days the video received more than three million views. A 25-year-old surfer and wildlife advocate named Tommy Knowles had posted the video after stumbling across it on YouTube. Then Facebook removed the video, citing a possible copyright infringement. But the graphic footage had already served its purpose. The video was covered by The Huffington Post, theNew York Daily News, and The Independent in the UK, and it helped to launch the fall hunt-monitoring campaign of the Wildlife Defense League. In 2010 Knowles had been on his way toward earning a business degree at Okanagan College in British Columbia when he learned about the annual dolphin hunts in Taiji, Japan and started to sour on the idea of a traditional career. After Sea Shepherd accepted his application, Knowles served as a deckhand in the waters of the Faroe Islands, monitoring the pilot whale hunting there, and later on the Steve Irwin during the group's Antarctic whale defense campaign. After the Steve Irwin made port, Knowles returned to BC and, in 2014, started the Wildlife Defense League. The group's first campaign was "Operation Great Bear." At the invitation of the Klabona Keepers – members of the Tahltan First Nation who live near Iskut, BC – the defense league helped create and then sustain a road blockade to keep non-Native hunters out of an area the Tahltan call "the Sacred Headwaters" in northern BC. The blockade was successful, though it led to a couple of tense confrontations with hunters seeking moose, wolves, bear, and caribou. On one occasion, a hunter tried to storm through the blockade but stopped when WDL members sat down in front of his truck. Knowles says his group is dedicated to direct action, which he defines as, "Any action that has an immediate effect on the protection of humans, animals, or the environment." The mission statement of the Wildlife Defense League reads: "To defend wildlife from exploitation while abiding by international conservation law and laws set out by First Nations. Wildlife Defense League uses non-violent tactics to document, monitor and expose those who attempt to destroy wildlife." The group's goal, Knowles says, is to ban trophy hunting in Canada. Like Rod Coronado and Wolf Patrol, Knowles believes that exposing what he says is the unnecessary cruelty of trophy hunting will eventually lead to halting the practice. And, also like Coronado, Knowles is committed to remaining within the boundaries of the law. Wildlife Defense League monitors and documents trophy hunting, but its members (usually about a half dozen people in the field at any one time) will not interrupt the actions of hunters. "We can interfere with the hunt for one day and be arrested and taken out of action," Knowles says. "Obeying the law is much more sustainable." So far – at least as measured by public attention and support – the strategy seems to be working. Earlier this year Knowles ran an Indiegogo campaign seeking $10,000 for food, fuel, and communications equipment to sustain the hunt monitoring; just two days after the grizzly-hunting video was posted on Facebook, the campaign exceeded its goal and raised $16,000. Knowles is now working with another Canadian environmental group, Pacific Wild, founded by photographer and filmmaker Ian McAllister. This winter they will begin filming the BC government's program of wolf culling, including its use of helicopters to track and then destroy wolf packs. And the videos themselves – of wolves dying in traps, of bears gunned down – have unquestionable power. Before Facebook removed the video from its site, I watched the clip of the grizzly shooting in BC, sickened by the image of the struggling animal and the flippant comments of the hunters, and was relieved that one click would remove me from the scene. "I can't imagine seeing wolves being gunned down from helicopters," Knowles told me during one of our conversations. "It is such a tragic and inhumane killing and to bear witness will be the most challenging thing I've ever had to deal with." That, of course, is the point: To make sure that we all have to bear witness to the harsh reality of trophy hunting, until we can't stand to look anymore, and finally decide, as a culture, to do something about it.